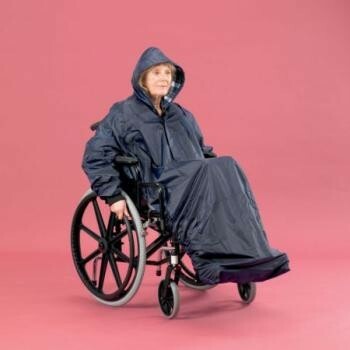 Seam sealed for total waterproofing, this Deluxe Mac offers complete protection for wearer and the wheelchair. Seam sealed for total waterproofing, this Deluxe Mac offers complete protection for wearer and the wheelchair. Lined with an attractive cotton tartan for additional warmth and comfort. The knitted cuffs are covered by the ends of the sleeves, giving a smart finish and preventing the fabric from getting wet. Elasticated all the way around to ensure a snug fit. Vents at the rear of the mac allow use of the wheelchair\'s pushing handles and a small pouch at the front provides handy storage.